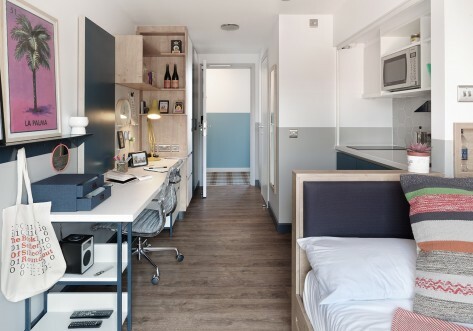 The rooms within the flats are all centrally heated, fully-furnished and have lockable doors. Rooms vary in size and consequently we have different price bands to choose from. We also split the flats up into all-male, all-female and mixed. We also have some flats for mature/postgraduate students. We’ll do our best to accommodate your preference, but we cannot guarantee it. Each flat has its own kitchen with cooker, microwave and fridge/freezer. You will need to bring your own pots and pans, cooking utensils, crockery and cutlery. The bedrooms are furnished with a bed, wardrobe, bedside cabinet, desk, chair and shelving. You will need to bring your own duvet, pillow and sheets. There is a TV aerial socket in each bedroom but you will need a TV licence for your own TV. 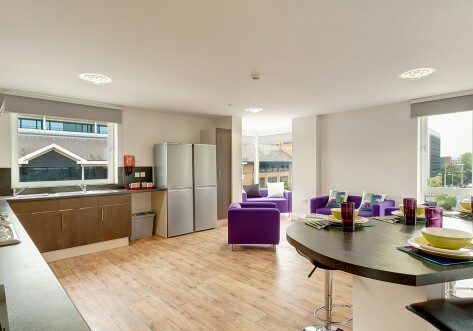 Residents are responsible for keeping the communal areas of the flats clean as well as their own rooms. Vacuum cleaners are located in the main office and bin bags are in the laundrette. Both are free of charge. In the courtyard there is bicycle sheds and a limited number of car parking spaces. A £100 refundable deposit is required to secure a car parking space. During office hours the building is staffed by John and Angela, who are the residential Hall Managers. Maintenance and caretaking duties are carried out by Leroy and Mike. The building is covered 24 hours a day by subwardens, who are fellow students, so in case of an emergency there is always somebody available to help. Claredale is conveniently placed just off Hackney Road in Bethnal Green. It is only 4 km ( miles) away from the City of London and is conveniently situated for most Central, North and East London universities. Claredale enjoys good transport links. Bethnal Green tube station is just 10 minutes walk away and Cambridge Heath Overground station is only 5 minutes walk away. Numerous buses run along Hackney Road into the City and the West End. When the tube and Overground stops there are still night buses that can get you from the West End back to Claredale. In the weekend there is night-tube service on the Central Line to Bethnal Green Station. All your most important shopping needs are right on your doorstep. Tesco Express is just 2 minutes walk from Claredale. There is also a bigger Tesco just a 10 minute walk away. Nearby you will also find newsagents, convenience stores, a post office and several trendy cafés and restaurants. There are plenty of local pubs and just a stroll away is Broadway Market, London Fields and Victoria Park. You can also easily make your way to Columbia Road Flower Market, Brick Lane Market, Spitalfields Market and Petticoat Lane Market either on foot or bus. A short walk will get you into trendy Hoxton and Shoreditch if you like clubbing or just hanging around watching the world go by. Category A is the biggest size of rooms available. It ranges between to square meters. It has a single bed, a night stand, a wardrobe, desk and chair and fitted shelves. Category B is a medium/big size of rooms available. It ranges between and square meters. Category C is a medium size of rooms available. It ranges between and square meters. Category D is the smallest size of rooms available. It ranges between and square meters.